This features offers each WP Residence client endless possibilities when designing the property page. We created 4 templates as examples which you can import as instructed in this help – http://help.wpresidence.net/2016/05/18/demo-setup-how-to-import-demo-property-page-custom-templates/ – but you can use our new shortcodes to create your own property templates. NOTE: This feature is released as an initial version. This shortcode allows you to create Agent area by combining agent info in any order you wish and (optional) with extra css classes, additional text or font awesome icons added by using the font awesome icon shortcode from the editor. 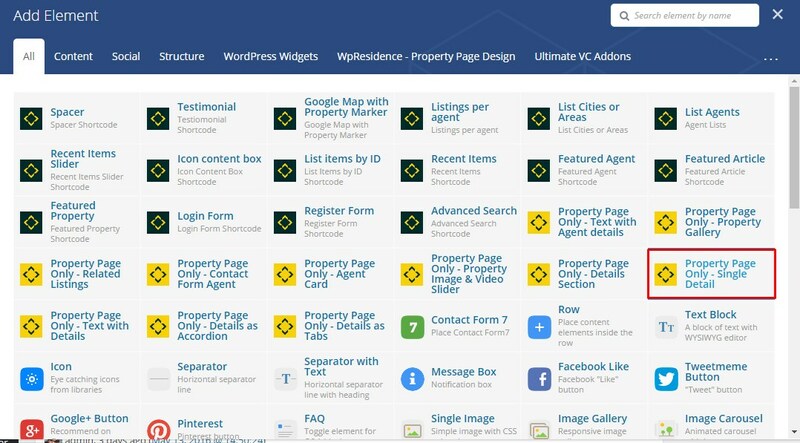 Property gallery is a new option added. As controls we allow each user to set the width of the thumbnail in px, the right and bottom margin in px and the max number of images to show. 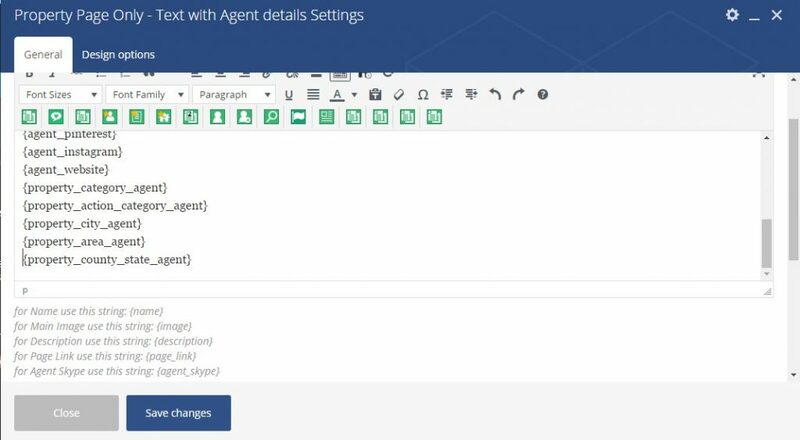 This shortcode will add the contact form for agent in page. IMPORTANT: Remember that you cannot use 2 contact forms in the same page. If you have the option to show Agent Info / contact on sidebar (help http://help.wpresidence.net/2015/10/29/property-content-options-settings) – don’t add a 2nd contact form in page. This shortcode adds agent info (same as in default design). You can choose to show the details in 2 columns or 1 column. One column means that agent details go below the image, two columns means agent details are on the right side of the image. Your options include horizontal http://wpresidence.net/properties/cement-factory-thompson/ or vertical thumb style – http://wpresidence.net/properties/2-rooms-manhattan/, with or without Google Maps / Street View icons in slider. You can set the number of columns for address, property details and features and amenities. This shortcode has default property fields, custom fields and features and amenities. 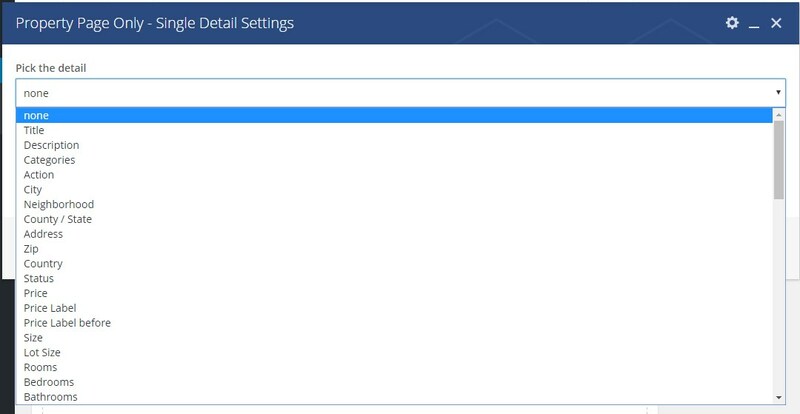 From the first dropdown you select what field you wish to show. This shortcode lists all the theme default / custom elements as single detail which you can use in text editor. With the editor you can add extra css classes to each element so you can create endless combinations. You can add additional text or font awesome icons added by using the font awesome icon shortcode from the editor. The elements are listed below the editor and it updates with your custom fields and custom features and amenities. 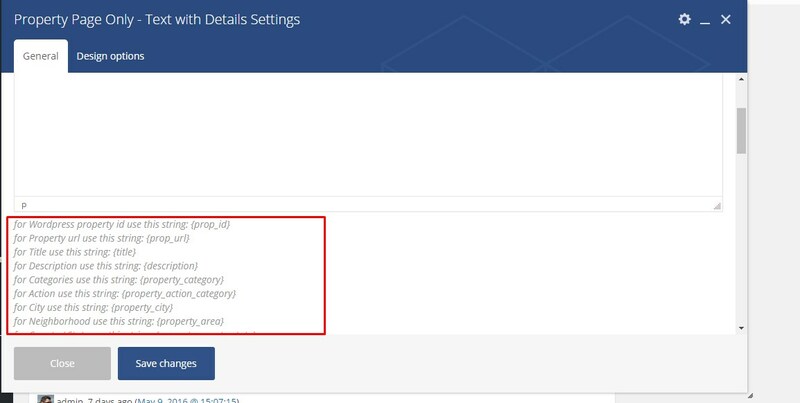 This shortcode lists all default property details section as accordion and you can use this to list in page only specific accordion elements from those available. Then you choose which elements to show. Default options are: Description, Property Address, Property Details, Amenities and Features, Map, Walkscore, Floor Plans, Page Views. 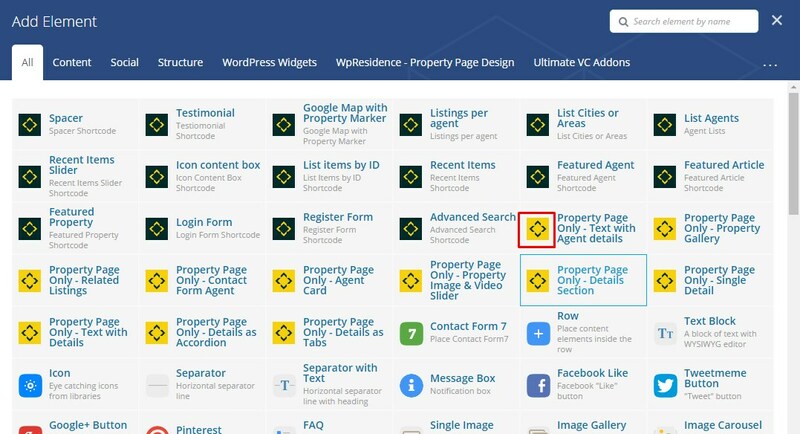 NOTE: Remember to have only one map per property page to avoid conflicts. This shortcode lists all default property details section as tabs and you can use this to list in page only specific tabs elements from those available. You choose which elements to show. Default options are: Description, Property Address, Property Details, Amenities and Features, Map, Walkscore, Floor Plans, Page Views.